Since ancient times, people from all over the world have let wild acetic-acid bacteria turn their alcoholic beverages to vinegar. Each with its distinctive flavor, aroma, and color, naturally-brewed vinegars are derived from sugar cane, molasses, fruit, or grain. Vinegars are vital as food preservatives, and they play important roles in such products as health and beauty aids, antiseptics, cleaning solutions, and medicines. All vinegars share a mouth-puckering acidity that refreshes tired taste buds and stimulates the appetite. 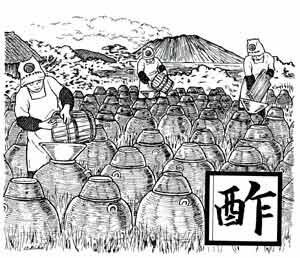 One of the world's most nutritious and delicious vinegars is made from 100 percent brown rice wine (sake) that is fermented in earthenware crocks, which are buried in the ground. This unique 1,000-year-old method survives only on Japan's southern island of Kyushu. Because it is made from brown rice, with its bran and germ intact, kuro-su (black vinegar) has a high concentration of essential amino acids. It is recognized not only for its mellow taste but also for its medicinal quality. Because it is rare and expensive, in Japan, Kyushu brown rice vinegar is usually taken as a health tonic. In the United States and Europe, it is sold in natural food stores as a fine condiment. The finest Kyushu brown rice vinegar in the world is made for Mitoku by Maruboshi Vinegar Company located in a remote areas of Kyushu, away from industrial pollution. With pure water, mild climate, and abundant local rice, Maruboshi enjoys ideal conditions for making brown rice vinegar. Mitoku Brown Rice Vinegar - 10 oz.